I have something to share with all of my local Houston friends. "Texas-born Ben Workman was pushed to the breaking point after a lifetime of discrimination and bullying. Until one day, something magical happened: Ben experienced an awakening that would change his life in a profound way. 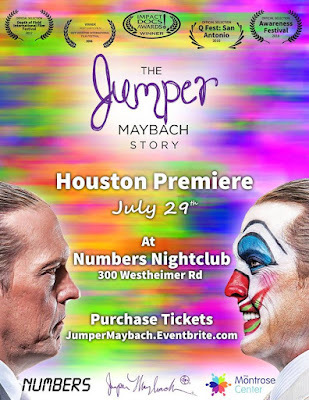 Enter Jumper Maybach, clown personae and abstract painter, alter ego of Ben Workman. Through his newfound freedom of expression, Jumper uses art to spread his message of universal love and acceptance. This is the inspiring story of how one man finds the courage to fight for equality in the face of overwhelming adversity and, along the way, discovers his true identity." I personally saw this documentary a year ago. Let me tell you, it brought tears to my eyes. I think we all can relate to his story. Also, Pepe Serna, a very well respected Hollywood actor will be here at the premier. He was involved in The Jumper Maybach Story. Pepe starred in movies like Scarface in the 1970s and has over 100 film credits to his name. Come on out to Numbers nightclub in Houston. I will be there so I hope to see you all there. So, I officially hit the ground running with my weight loss (after some travel) on Monday. I am doing something new to my routine. My WONDERFUL friend and mentor is a distributer for Arbonne (Pam Skaar). She and her daughter Melissa Theilig did the 30 day to healthy living and beyond and had amazing results. It's not a weight loss program, it's a healthier eating program....which results in weight loss. I decided to bite the bullet (It is an investment). So, I started my Belviq to help me with this transition. I did the math. As a "preferred customer", I paid around $250 for a 30 day routine. You eat a shake in the morning, one at lunch and then a healthy clean dinner (with healthy snacks in between). Look, I eat out every day for lunch. I was spending a min of $10 a work day. So minimally, I would spend about $200 eating out. So, I am saving that much money right there. There are many other steps to the routine. Between Monday and Wednesday, I lost 1.8 pounds!!! I am PUMPED UP again. I found my MOJO like I did in 2013. If you want more information, you can visit the Arbonne website of Pam Skaar at Pamelaskaar.arbonne.com. She is a truly AMAZING person. Her husband was my hometown pastor. They now live in Grand Prairie, Texas. She cares about everyone!! I know it's been a really long time since I posted anything. So, here is the skinny of what I have been up to. As most of you remember, about a year ago I had a bi-lateral knee replacement on my left knee. The surgery went well, the recovery...not so much. About 3 months into physical therapy, I knew something wasn't right. I would see people in physical therapy who were much older than I was and had a complete replacement a month or two after me who were doing so much better than I was. The pain was indescribable. It was like no other pain I had experience. The weird thing was, my range of motion was way beyond expectations. Plus the strength in my knee was excellent. I kept telling the doctor that something was wrong. He referred me to a specialist in pain management. I broke down in tears and told the doctor I didn't want drugs, I wanted answers. This new doctor told me that this was why I was there. He said that my first doctor suspected that I had something called Reflex Sympathetic Dystrophy (also known as Complex Regional Pain Syndrome). What the heck is that???? Well it's a condition that affects the sympathetic nervous system caused by trauma or, in my case, surgery to the effective limb. This new doctor told me that the only way to know is a sympathetic lumbar nerve block. I would go under general anesthesia and they would do the block. I was to write down my symptoms and how I felt for the first 48 hours after. The day after the block my friend caught me running up the stairs, something I was unable to do because of pain. I realized, for the first time since the knee replacement, my pain was minimized. At my follow up visit, I was officially diagnosed with RSD. The issue we have now is, to get it in remission. This required me going under general anesthesia every 2 weeks from February through July for these nerve blocks, in addition to medications that made me sleepy and tired. Finally, we think I am in remission. 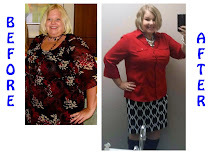 So, what does all of have to do with my weight loss? Unfortunately, because I was not able to move around a lot and with my focus on getting into remission, I put my weight loss on hold. In fact, my eating habits were not good at all and I gained about 20 pounds back. Look, 20 pounds is minor compared to the 80 I initially lost. It could be worse. Now that I am officially in remission, I started my weight loss journey back this week. I am going to talk to my doctor about going back on Belviq again to help me get jump started. 2. Go on Belviq hopefully next week for at least a month or maybe 2 months to jump start my journey. 3. I would like to lose the initial 20 pounds that I lost in the next 30 days. That is achievable I feel...if you remember, I lost 13 pounds my first week and a half on Belviq when I first started. 4. I want to get back in the gym. I have to be very careful to not set off my RSD, so I will be discussing with my doctor what I can do and what to avoid. 5. Start blogging again on a weekly basis to keep myself accountable and for everyone to have an update on what's going on in terms of my goals. I'm excited to move past this bleak time of my life and to get back into the lifestyle I had before all of this happened. In October, I had a bilateral knee replacement surgery on my left knee. For those of you following my blog, you all know that this was something I knew I was facing for about 3 years. The recovery was tough. BEYOND tough. I had a really bad reaction to medication. I was only going to be off work for 2 weeks, but ended up being off work for 7 weeks. For 2 months, I couldn't pick up my leg to even get in the car. I had to literally pick it up with my hands to get it into the car. It just didn't go as planned. I gained about 10 or 15 pounds during this time because of inactivity. I couldn't even do basic grocery shopping for the longest time, so I had to eat what I could. I am VERY lucky that, even with the holidays, I didn't gain more than that!!! I am in a better place now with my knee. I still can't work out yet, but there is hope around the corner and I will soon be able to get back into the gym. I also started back on Belviq yesterday to help jump start my diet patterns. I don't plan on being on it for long, just needed a little motivation!!! Anyway, that's the skinny, or the fat of it all. Hope you are having an awesome 2016. Yup, My Triglycerides are considered "Optimal". I am so happy!!! Now, my cholesterol still needs work!!!! I'm "barely" over the borderline rage so I have some work to do!! Anyway, I am still maintaining my weight with no issues at all. No gains which make me happy. One of these days I'll get back on track but for now, I am happy and just enjoying life. Maybe when it cools down!!! I hope all is well. I am doing great!! I am working with a personal trainer 3 times a week. I just started back a few weeks ago. I have some AMAZING NEWS: The time has come where I no longer need the aid of weight loss medication. Belviq and Bel-phen was amazing and got me to where I am today. But I have been off of both for a little while and I have pushed through a long plateau and now I am doing this completely on my own!! I never thought I would get to this point. But I am here!!! I have also started a new meal regimen. I start off in the morning with a protein shake as a meal supplement. It's chocolate and has chia seeds which are rich in omega 3's. Now, for those that know me will remember - I HATE SHAKES. Protein shakes generally taste yucky. But this shake is YUMMY!!! It literally tastes like chocolate milk. It comes in powder form and I mix it with vanilla silk. With the Silk, I get my entire breakfast for 200 calories. Known as “running food” by Aztec Warriors, and deriving its name from the Mayan work for “strength,” Chia seed has a rich history of being a powerful nutritional supplement with its use dating back to 3500 B.C. Aztecs and Mayans consumed Chia seeds regularly, grinding them into flour, pressing them into oil and drinking them mixed with water to increase stamina, endurance and energy over long periods for battle. Chia seeds are considered a “super” food because they deliver the maximum amount of nutrients with minimum calories. The nutritional benefits of chia seeds include fiber, omega fatty acids, calcium, antioxidants and much more - even protein! Even more amazing, chia seeds absorb up to 12 times their own weight and expand to curb your appetite, so adding just an ounce or so of chia seeds to your diet can reduce caloric intake and help lower the energy density (or calories) of foods while doubling the amount of fiber. I took my blog offline for about a month because of some drama that was going on with some investors. But, I found that I started losing motivation again. My blog kept me going, it was like a diary and the positive affirmations I got really helped me push through. So, I am back at it - only this time, my focus is ME - not THEM. I know that I also helped a lot of people through my blog and many have asked for me to reconsider. So, I am also doing for those that are like me, looking for a change. That being said, I still am where I was when I left off - no gain. I look great, feel great, and now I am ready to push forward. I have taken some much needed me time. I bought a cute black and white dress yesterday, it's a little snug, but will fit great in 10 pounds. So, those that have followed me will know, I am motivated by clothes. I will hope to be in my cute dress by the end of April. Wish me luck. For now, here are a few newest (BLURRY SORRY) pictures. Call Eisai at 1-888-274-2378 and within 3-5 days Eisai will send you a list of a few doctors in your local area who prescribe Belviq. Good Luck! This is a great video to explain how does Belviq work! 10 week weigh in! Did I meet my goal?